Today promised to be interesting. Biggest problem was moisture return... without which storms would be high-based and unlikely to tornado. This day turned out to be typical of a storm chase, so there are a bunch of photos here to illustrate. First, was forecasting. 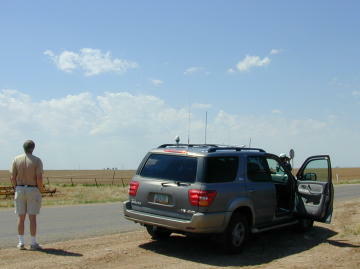 Then we drove to our target area and stopped to watch the sky, get gas, and get data in Crosbyton, Tx. 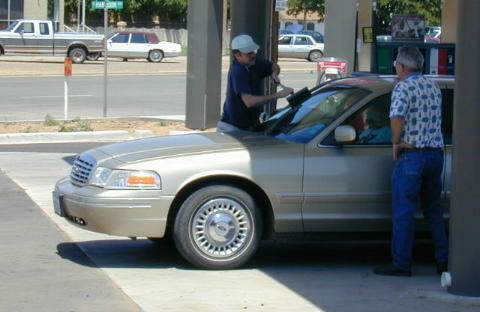 The one atypical event was Jim pretending to be a gas station attendant and washing a stranger's car windows! 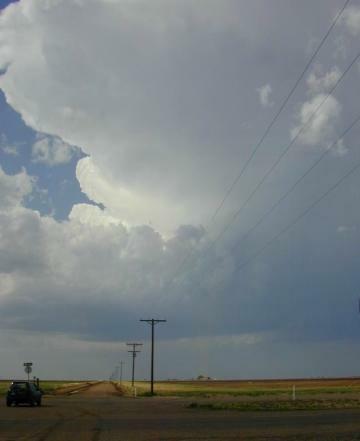 It turned out we had strayed into the dryest air in the Texas Panhandle, but after a while what every chaser watches for started... developing cumulus clouds. We maneuvered into the thicker of the Cu field, and eventually caught a glimpse of a new thunderstorm anvil with a nice base. At this point, a chaser convergence developed, as other panhandle chasers vectored in to the storm. 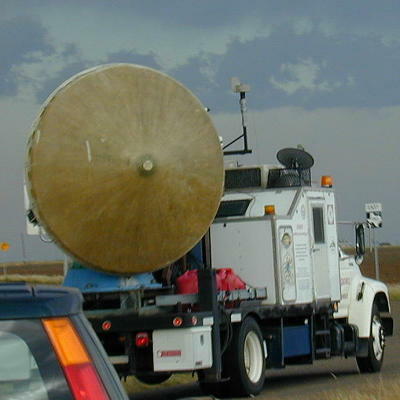 Even a Doppler-On-Wheels team appeared, researching the growing storm with their mobile doppler radars. 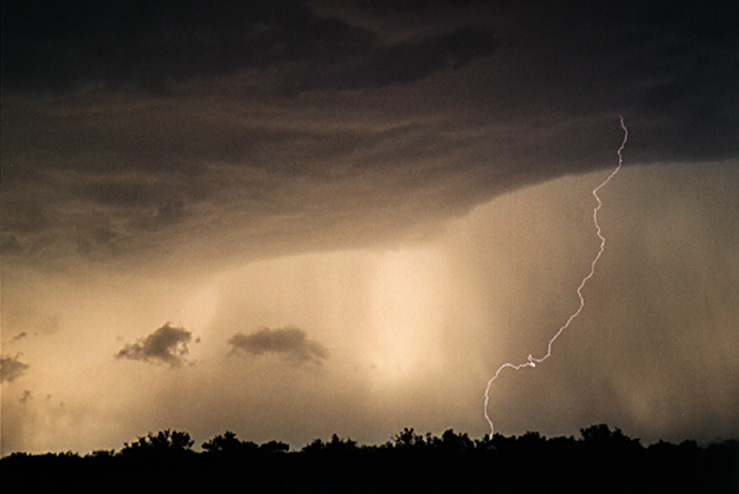 After a while, the storm developed into a "LP" (Low Precipitation) supercell. 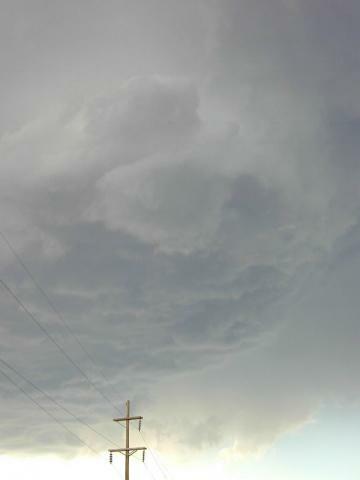 At one point a portion of the base near us developed a nice cyclonic rotation. Had the storm been lower based, we might have anticipated a tornado developing from this area... but the dewpoint spread was high and the storm was too high based. We escaped to the south, and near sunset got this picture of our storm. 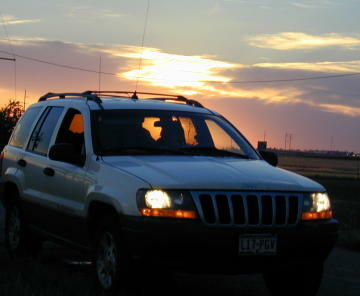 And, as we headed home, the sun set behind the chase team of the "Twisted Sisters" (Linda Kitchen and Kathy Velasquez).